Constructed in Oct./Nov., 1937 in memory of the fallen W.W.I. veterans. 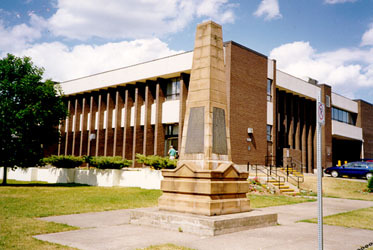 The World War One Cenotaph at Antigonish is located at the Federal Building Grounds, Main St. It was previously located at the intersection of St. Ninian St. and Main St., West end of town. It was built on the above location in October/November of 1937 and was unveiled on November 11, 1937. The material used in its construction was a North Grant (Antigonish County) sandstone. It is a plain obelisk, 17 feet high, tapering to a pointed cap, designed and completed by F.W. Arsenault. The concrete base was put in and donated by the MacDonald Construction Company, Halifax, N.S. On three sides of the monument are black granite slabs on which the names of the dead were carved by W.T. Dalton, Shelburne. On the North side is an inscription composed by Miss K.M. MacDonald, Teacher in England at Morrison High School (1937). It was after a great deal of searching through old newspapers that I came up with this information. I can definitely say that it was the people of Antigonish and surrounding areas that donated to the fund toward the building of the Cenotaph in the town of Antigonish. There is even reference to a committee of Canadian ex-servicemen in greater Boston (as the paper reads) staging a social evening in Brighton, the proceeds to go to the fund being raised to pay for the war memorial begin erected here (Antigonish). "This will give an opportunity for natives of Antigonish Town and County in Metropolitan Boston to help provide a monument to those who lost their lives in the Great War."